a term related to the whole process of catching and marketing fish and shellfish for sale. *It refers to and includes fisheries resources, fishermen, and related business directly or indirectly involved in harvesting, processing, or sales. It is estimated that the 2.5 million acres of North Carolina marine and estuarine waters generate approximately $100 million worth of seafood landed per year for the fishing industry. 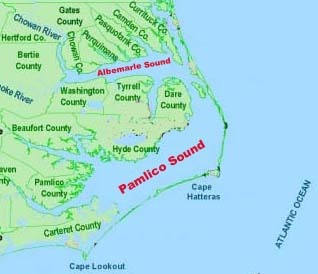 Among these waters, the Pamlico Sound provides 90% of the state's commercial fish and shellfish catches. The two tables below list the value of the major fisheries in North Carolina and how they compare with catch value from other states. Table 1 ranks the top 10 most valuable seafood based on dollars generated at the dock. Table 2 compares these top 10 NC fisheries with landing values from all other states in the U.S., and indicates the NC fishery's national ranking. North Carolina's Marine Fisheries Commission and the state's Division of Marine Fisheries (DMF) are responsible for overseeing and regulating the state's coastal commercial and recreational marine fisheries. 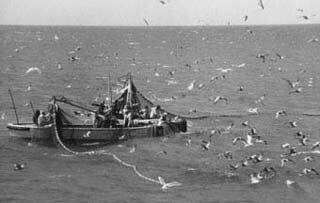 Extensive monitoring of commercial fishing harvest did not begin until the mid 1970s. Fishing regulations include closed fishing areas, designated fishing seasons, equipment restrictions, possession of permits and licenses, and reporting weight of harvest to NC DMF. These regulations are primarily targeted at commercial fishermen. No fishing license is required for saltwater recreational fishing in North Carolina, however, recreational fishermen are required to have permits for any use of commercial gear. In addition, there are restrictions on size, species, and daily allowable catch. In North Carolina, there were approximately twice as many commercial vessel fishing licenses in 1990 (20,100) as there were in 1970 (10,500). Moreover, fishing methods have changed greatly over the last 20 years, partially because of changing regulations, but more due to electronics, gear improvement, and economics. Newer technology and the economics of scale have greatly increased the efficiency of the coastal fishing industry, both commercial and recreational. How do you think the increased fishing vessels and improved technology affect the blue crab population in North Carolina? This web site was created by Lynn Tran at the North Carolina State University, Department of Mathematics, Science, and Technology Education on 7/12/03. Faculty advisor Dr. David Eggleston, NCSU, Department of Marine, Earth, & Atmospheric Sciences. Last updated December 29, 2003 .